Milan Amatya is Nepal as well as Assam’s most well known singer. 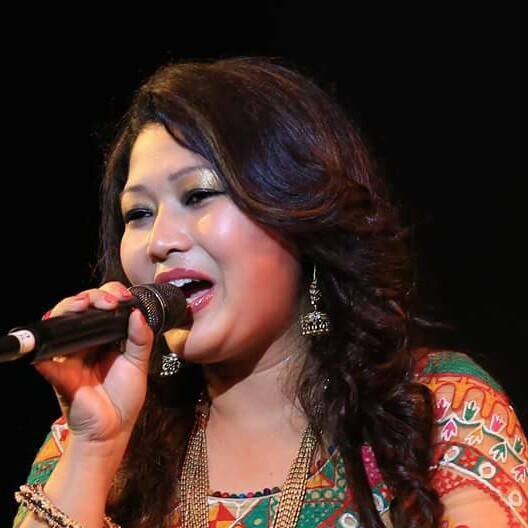 She has sung in all the major north eastern languages (Assamese, Bodo, Mishin) beside Nepali and Rajasthani. Milan Amatya was born on January 27, 1986 in Nunaikhuti,Goriajhar(Assam), into Nepali household. Her exposure to music began in infancy. Her training in music started at the age of 4 at her birthplace and after that, at the age of 11 she moved to Guwahati for more exposure to musical world. Milan’s musical studies were not limited to hearing her father and mother sing. She also studied under her aunty Miss. Dukuna Newar and acquired a good background in folk and was trained by Shri Badri Vyas in Rajasthani music. Her Mother Mrs. Ambika Newar & Father Mr. Ganesh Newar are her inspiration. Rajasthani Folk song Training from Shri Badri Vyas (Assam). After coming to Guwahati, She joined production company “Surganga” which has released 40 albums of Rajasthani Folk songs, 10 Assamese, 4 Bodo and 10 Nepali albums. 2003, proved to be very crucial year in her life. This year on 30th October, she participated in All India Musical Competition organized by Surganga. The programme was based on Assamese and Rajasthani Folk songs and the programme was judged by Famous Musical Maestro of Bollywood Late Naushad Ali and Famous Gazal Singer Pinaz Masani accompanied by Famous Classical I Singer Sushila Rani Patel. Milan was the 1st runner up on this show and after this there was no looking back. After this competition she decided to launch her own album of folk songs and her musical career has begun to flourish. Khunmani (Bihu Songs), Akou Anupama, Kunwali, Rangdhali, Gamusa. Rojeni Arnai, Fri Fri okha. Kanchi, Mero Mann, Maya,Asha, Tirsana,Baduli, Maya ko indreni. Ghoomar, Ruma Jhuma, Chudidar Gajaro and Holi songs Devar Mharo re. Lagan Shyam Sang Lagi, Parchio Babero, Ghume Ghodaliyo Babero. She came to Nepal in 2011 for the purpose of extending her talent in singing career and made a plan for launching her album. She released her first brand new album – Milan (Music Meets Soul) in 12 Dec, 2011. She got a very good response and praised by the people of Nepal and likewise she successfully enters into Nepali Musical World. All the song from this album became popular but the song “Jahile Samma Sansar Ma” is became the eminent and able to touch the heart of the listeners. Recently, she have released her second solo album "Madhur Milan". 1. 14th Annual Image Award, 2012 as a Best Vocal Performance Female. 2. 8th Kalika FM Music Award, 2012 as a Best Vocal Performance Female. 3. Bindabasini Music Award, 2012as Best Modern Female Singer. 4. Gurkhali Music Award, 2012 as a Best Playback Singer Female. 5. 9th Kalika FM Music Award, 2013 as a Best Playback Singer Female. 6. 9th Kalika FM Music Award, 2013 as Best Duet Song Singer. 7. 5th HTV Filmy Khabar D Cine Award, 2013 as a Best Playback Female Singer. 8. 15th Music Honor, 2013 as a Best Modern Female Singer, organized by Radio Kantipur (Radio Rastra ko). 9. Blue Diamond Star FM Music Award 2070 as a Best Playback Female Singer. 10. 3rd Music Khabar Music Award 2014 as a Best Playback Female Singer. 11. Online Filmy Khabar Award 2071 as a popular Female Singer. 12. 10th Kalika FM Music Award 2014 as a Best Playback Female Singer. 13. 7th NEFTA Film Award 2014 as a Best Playback Female Singer. 14. INFA Film Award 2014 as a Best Playback Female Singer. 15. 16th Music Honor, 2014 as a Best Modern Female Singer, organized by Radio Kantipur (Radio Rastra ko). In the year 2013, Milan Amatya was honored by the very prestigious award called “Natikaji Lokpriya Sangeet Prativa Puraskaar” received from the hand of respected president of Nepal Dr. Ramvaran Yadab which was organized by Natikaji Smriti Samajh and till date in her singing career it is the biggest award she got in Nepal. Presently she is residing in Nepal and she has sung more than 300 songs in collection albums and films. Her song “Gala Ratei” from the movie Notebook and “Slowly Slowly” from the movie Kaali are the most popular and reached the highest viewers in YouTube compared to other songs. She has performed stage shows in almost all the main cities of Nepal, India and international countries like Brunei, South Korea, Qatar, Hongkong, Malaysia, Denmark & Bahrain. Recently she was engaged with the companies like Ncell, Blue Diamond for concert in the major cities of Nepal.